A hyper dog can be an energetic, active companion or an unending source of mischief and trouble, depending on your energy levels and how you handle your dog's behavior. Which are the most hyper dog breeds, and are you ready for their energy? Is a Hyper Dog Right for You? Activity Level: If you enjoy long walks, active sports, plenty of exercise and time outdoors, you can easily help a hyper dog breed work off its excess energy. If your ideal relaxation is quiet time such as reading a book, doing crafts or watching television, however, you may want to consider a more sedentary breed. Time at Home: Hyper dogs can easily become stressed or anxious if they feel confined for too long, which can lead to undesirable behaviors such as excessive barking or chewing on forbidden objects. If you are away from home for long periods of travel, excessively long work days or an active social calendar, a slower-paced pet might be a better choice. Family Members: Consider all family members before choosing a dog breed. Most hyper dogs do not socialize well with very young children, particularly infants and toddlers, because they may not control their energy well enough to avoid inadvertent injuries. Similarly, elderly family members may not be able to keep up with a very energetic, hyper dog. Available Space: A hyper dog needs room to use up its energy, and a larger home with a good-sized yard is best. If you don't have a yard, easy access to a large park can be helpful. If you live in a small apartment without nearby parks, however, a less energetic dog breed might be a better choice for your new best friend. Commitment to Training: High-energy dogs require dedicated training not only for basic obedience, but to keep both their minds and bodies engaged throughout their lives. Before you adopt a hyper dog breed, be sure you are willing to train your dog appropriately and reinforce and expand that training beyond basic commands. It should be noted that while these dog breeds are particularly noted for their high energy levels and high strung personalities, any dog of any breed can be hyper. A dog's exact personality is unique, and any dog may be hyper depending on its training, diet, exercise and activity levels, age, discipline and other factors. Establish a strong routine so the dog knows what to expect and when to expect it, and reinforce that routine with firm, positive commands. Focus on training as a lifelong task, expanding beyond obedience to agility, sports or hunting training to give your dog something new to learn and practice. 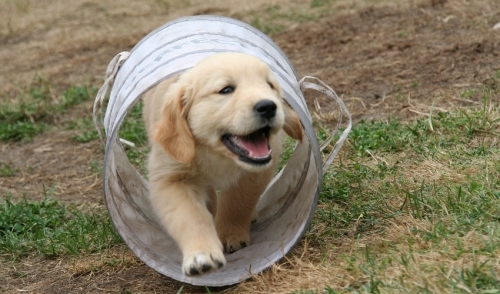 Provide your dog with adequate, stimulating exercise both for its body as well as its brain. Treat toys, fun games and new experiences can help your dog use its energy productively. Feed your dog a proper diet for its age, breed and temperament. Avoid overfeeding or too many treats that can cause obesity and hinder your dog's behavior so it can't work off its energy. Watch for situations that trigger your dog's hyper behavior, such as meeting strangers or visiting the veterinarian, and work on training solutions specifically for those circumstances. A hyper dog can be a wonderful pet, if you are familiar with what it takes to help calm your dog and harness its energy in fun, productive ways. Knowing which dog breeds are the most hyper is the first step toward choosing a new canine companion with the right energy level for you and your family.